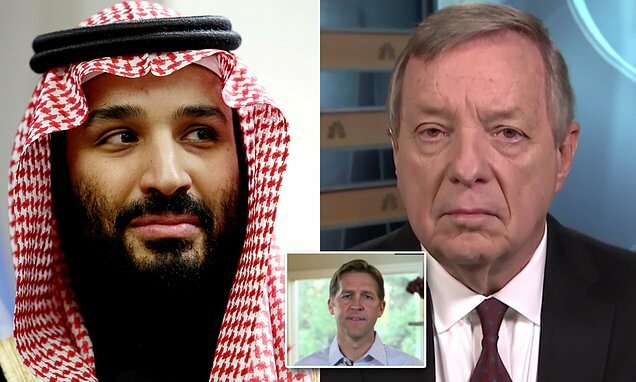 There's a growing chorus from a bipartisan group of lawmakers for Saudi Arabia - and possibly Crown Prince Mohammad bin Salman - to face harsh consequences for the death of journalist Jamal Khashoggi. Republican Sen. Bob Corker, the chairman of the powerful Senate Foreign Relations Committee, said the U.S. should punish the crown prince if an investigation shows he was behind Khashoggi's death. Saudi Arabia has denied the crown prince had any previous knowledge of an operation against the dissident journalist but intelligence officials express doubt how the authoritarian ruler could not have known. Corker said he personally thinks MSB - the crown prince is known by his initials - is guilty of ordering Khashoggi's death. 'Do I think he did it? Yeah. I think he did it,' he said. Turkey and Saudi Arabia have been at odds over what happened to Khashoggi since he entered the Saudi consulate on Oct. 2 and was never seen again. Turkish officials claim a 15-man hit squad tortured and killed the journalist, bringing in a forensic expert to dismember him. Saudi officials originally said Khashoggi left the consulate but dramatically changed their story on Saturday, claiming he was killed in a fist fight in the consulate. His words were echoed by fellow Republican Sen. Ben Sasse of Nebraska.